Musicians can learn about the history of musical genres, ornaments, composers, and theorists with these classical flash cards. agrements ORNAMENT in French music, usually indicated by a sign. ballad opera GENRE of eighteenth-century English comic play featuring songs in which new words are set to borrowed tunes. binary form A FORM comprised of two complementary sections, each of which is repeated. The first section usually ends on the DOMINANT or the relative major, although it many end of the TONIC or other KEY; the second section returns to the tonic. development (1) The process of reworking, recombining, fragmenting, and varying given THEMES or other material. (2) In SONATA FORM, the section after the EXPOSITION, which MODULATES through a variety of KEYS and in which THEMES from the exposition are presented in new ways. fuging tune Eighteenth-century American type of PSALM or HYMN tune that features a passage in free IMITATION, usually preceded and followed by HOMOPHONIC sections. galant Eighteenth-century musical style that featured songlike MELODIES, short PHRASES, frequent CADENCES, and light accompaniment. intermezzo Eighteenth-century GENRE of Italian comic OPERA, performed between acts of a serious OPERA or play. lied Song with German words, whether MONOPHONIC, POLYPHONIC, or for voice with accompaniment; used especially for polyphonic songs in the RENAISSANCE and songs for voice and PIANO in the eighteenth and nineteenth centuries. minuet DANCE in moderate triple METER, two-measure units, and BINARY FORM. opera buffa Eighteenth-century GENRE of Italian comic OPERA, sung throughout. opera seria Eighteenth-century GENRE of Italian OPERA, on a serious subject but normally with a happy ending, usually without comic characters and scenes. rondo Piece or MOVEMENT in RONDO FORM. sonata form FORM typically used in first MOVEMENTS of SONATAS, instrumental chamber works, and SYMPHONIES during the CLASSIC and ROMANTIC PERIODS. An expansion of ROUNDED BINARY FORM, it was described in the nineteenth century as consisting of an EXPOSITION, DEVELOPMENT, and RECAPITULATION based on a limited number of THEMES. string quartet (1) Standard chamber ENSEMBLE consisting of two VIOLINS, viola, and cello. (2) Multimovement COMPOSITION for this ENSEMBLE. strophic Of a poem, consisting of two or more stanzas that are equivalent in form and can each be sung to the same MELODY; of a vocal work, consisting of a strophic poem set to the same music for each stanza. symphony Large work for ORCHESTRA, usually in four MOVEMENTS. variations form FORM that presents an uninterrupted series of variants (each called a VARIATION) on a THEME; the theme may be a MELODY, a BASS line, a HARMONIC plan, or other musical subject. cabaletta In the operatic scene structure developed by Gioachino Rossini in the early nineteenth century, the last part of an ARIA or ENSEMBLE, which was lively and brilliant and expressed active feelings, such as joy or despair. See also CANTABILE and TEMPO DI MEZZO. cantabile (1) Songful, lyrical, in a songlike style. (2) In the operatic scene structure developed by Gioachino Rossini in the early nineteenth century, the first section of an ARIA or ENSEMBLE, somewhat slow and expressing a relatively calm mood. See also CABELETTA and TEMPO DI MEZZO. developing variation Term coined by Arnold Schoenberg for the process of deriving new THEMES, accompaniments, and other ideas throughout a piece through variations of a germinal idea. etude An instrumental piece designed to develop a particular skill or performing technique. exoticism Nineteenth-century trend in which composers wrote music that evoked feelings and settings of distant lands or foreign cultures. idee fixe term coined by Hector Berlioz for a MELODY that is used throughout a piece to represent a person, thing, or idea, transforming it to suit the mood and situation. leitmotiv In an OPERA or MUSIC DRAMA, a MOTIVE, THEME, or musical idea associated with a person, thing, mood, or idea, which returns in original or altered form throughout. mazurka A type of Polish folk dance (and later ballroom dance) in triple METER, characterized by accents on the second or third beat and often by dotted figures on the first beat, or a stylized PIANO piece based on such a DANCE. nocturne Type of short PIANO piece popular during the ROMANTIC PERIOD, marked by highly embellished MELODY, sonorous accompaniments, and a contemplative mood..
polonaise A stately Polish processional DANCE in triple METER, or a stylized piece in the style of such a dance. recital Term popularized by Franz Liszt for his solo piano performances and used today for any presentation given by a single performer or a small group. rubato Technique common in ROMANTIC music in which the performer holds back or hurries the written NOTE values. thematic transformation A method devised by Franz Liszt to provide unity, variety, and a narrative-like logic to a composition by transforming the thematic material into new THEMES or other elements, in order to reflect the diverse moods needed to portray a PROGRAMMATIC subject. posttonal General term for music after 1900 that does not adhere to TONALITY but instead uses any of the new ways that composers found to organize pitch, from ATONALITY to NEOTONALITY. avantgarde Term for music (and art) that is iconoclastic, irreverent, antagonistic, and nihilistic, seeking to overthrow established aesthetics. futurists Twentieth-century movement that created music based on noise. atonality Terms for music that avoids establishing a central pitch or tonal center (such as the TONIC in TONAL music). 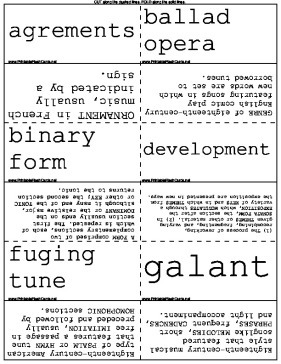 pitchclass set A collection of PITCH-CLASSES that preserves its identity when transposed, inverted, or reordered and used MELODICALLY or HARMONICALLY. serialism Music that uses the TWELVE-TONE METHOD; used especially for music that extends the same general approach to SERIES in parameters other than pitch. cumulative form FORM used by Charles Ives and others in which the principal THEME appears in its entirety only at the end of a work, preceded by its DEVELOPMENT. tone cluster Term coined by Henry Cowell for a CHORD of DIATONIC or CHROMATIC seconds. indeterminacy An approach to composition, pioneered by John Cage, in which the composer leaves certain aspects of the music unspecified. Should not be confused with CHANCE. total serialism The application of the principles of the TWELVE-TONE METHOD to musical parameters other than pitch, including duration, intensities, and TIMBRES. See SERIAL MUSIC. prepared piano An invention of John Cage in which various objects-such as pennies, bolts, screws, or pieces of wood, rubber, plastic, or slit bamboo-are inserted between the strings of a PIANO, resulting in complex percussive sounds when the piano is played from the keyboard. neoromanticism A trend of the late twentieth century in which composers adopted the familiar tonal idiom of nineteenth-century ROMANTIC music and incorporated its sounds and gestures. sprechstimme A vocal style developed by Arnold Schoenberg in which the performer approximates the written pitches in the gliding tones of speech, while following the notated rhythm.